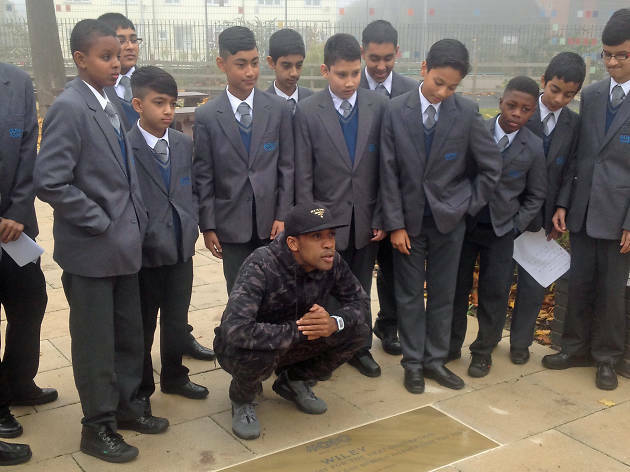 We’ve always known that Wiley is so Bow E3, but now the MOBO Awards have gone and proved it by installing a paving stone tribute to the grime innovator in the playground at Bow School in Tower Hamlets. Twenty years ago, Wiley attended Bow Boys (as the school was known back then). At 9am this morning, he came back to the school's new site to unveil the stone, which is part of a special MOBO 'Paving The Way' award. The MC kicked off his day by giving an inspirational speech and Q&A to some Year 9 students, including shout-outs to Dizzee Rascal, his dad, his old headmaster, Skepta and JME and FKA Twigs. 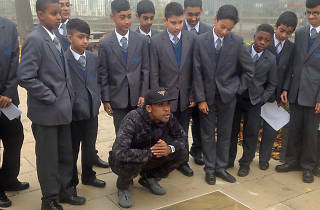 Then everyone went outside to see the Wiley Stone, which has been installed two years after a petition to Tower Hamlets council failed to get a statue of the rapper put up in the borough. Is it weird to have this big slab in the ground with your name on it? Did you choose the quotation on the stone and the location? Is Bow the home of grime? Who else deserves a Paving The Way stone? Just loads in London, then. Watch the MOBO Awards on ITV2 on Wednesday November 4, 8pm.